Earn $2.74 in VIP credit (274 points)What's This? The redesigned Velo 7 is an excellent quality entry-level computer with all the basic functions. The larger screen is even easier to read and set up is made simple with pre-programmed tire sizes. Single large button for ease of operation. Wired attachment. Fits handlebars 22 to 32mm in diameter. Fits forks from 11-55mm in diameter. Silver. Excellent value. Easy to use and durable. More so than other basic computers bought elsewhere for the same price. Functioning well after a month on my beater. No complaints. Very simple, basic and straight forward cycle computer. I like the one button operation. numbers are good to read. Only one battery to deal with. Easy to cycle through functions. Nothing negative to say yet. Easy to read, clear display and well worth the price. Quality product. Installation is not simple. This little computer is really made well. The instructions were a bit baffling, but the install really went well- much simpler than the instructions make it seem. The display is large, crystal clear, and can be read in direct sunlight. Just awesome. The one bad thing about it? It shows the unpleasant truth about just how slow I am! Just what I needed for my little mule city mountain bike! Gives me the basic information that I need while at the same time is rock solid. Now that I can keep track of my miles it's less of a guess when I should be doing maintenance too. A good basic computer, gives you all the data you need, large screen, easy to read, easy to install. Easy to set up, very reliable, once set up it continues to work, unlike my previous computer. Great computer for the price, Cat Eye is the way to go. Got this computer a few weeks ago and its been running great in the cold weather here in Montana. BikeTiresDirect had the best price that I could find anywhere and I am loving it. Easy to read screen and simple one button function makes it easy to use on the go. If you're looking for a solid beginning cyclometer this is the way to go, all the functions you need and nothing you don't. Put it on my Mountain Bike. Fit up easily. Been putting miles on the road bike so not much use yet. Easy to read and operate on the bike. Very durable - I wrecked my bike and this computer flew off. I reattached it and it worked like nothing happened. It has what I need. This is a low cost, yet very useful device for general biking. It has all the function I need to help me train. I also like to use it on long bike hikes. It took a while, but was not too hard to put on my bike. If you don't want to spend a lot of money, but still want to know how far and fast you are going, I would get this one. Installed pretty easily with the usual hassle of setting a digital device. I haven't found any way to set the overall odometer mileage. Since I replaced one that had 18,500 miles on it it would be nice to be able to register that in this unit. It tracks the speed and mileage accurately and is easy to set the trip distance. This company is excellent to deal with. I placed this order just before leaving for several days and asked them to delay the shipment so it would arrive after I returned. Their timing was perfect. For the price this is a great value. I've had one for about 1 12 years, with a bit over 1,000 miles on it. I like the simple one button operation feature, whereas some have two buttons...The set up directions are a bit confusing, but you are smart you will figure it out. The main draw back to this model is the absence of trip time...So on all my other bikes I have the Velo 8 which has this feature, wish the Velo 8 was offered here on this site. First off, I haven't had this on my bike very long. After reading a few reviews and seeing this on sale I decided to purchase it. So far I am happy with it. Mounting the computer on my bars was easy enough for the wired I did cut up pieces of cardboard to stack up on my forks to make sure the wired sensor was close enough to get within specs of the magnetic piece that mounts on the spokes. The instructions aren't that great. I did try several times to get the clock set... in the end I didn't, I didn't order it for the clock anyway. I wanted to know my speed and keep the mileage on my bike. I'm giving it three stars cause the instructions aren't that great and the clock issues. 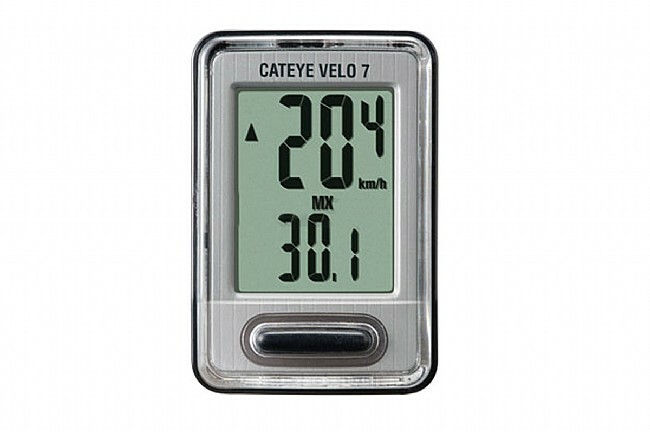 This is my 1st Cateye Computer for my Mongoose! I had a Walmart supplied more expensive one than the Cateye but, the operation was very shoddy! I am tickled to death to have such a good operaating Cateye Computer. As I stated above, my other one I paid a little more than $26.00, and it worked about like a 19Cent one lol. I was so fed up with the way that it worked that I just went into to the bicycle shop and ask the attendant what was a good computer, he told me, The Cateye is the oldest and the best made for any price. He sure was right about the performance of my Cateye, it has not missed an inch of calculating except, for the time I forgot to put it back in its saddle on my ride home lmao. Oh well, Crap happens!, they say lmao! Well, thanks for allowing me to share my enjoyment with my new CATEYE COMPUTER.